Swaziland is a small kingdom surrounded entirely by Mozambique and South Africa. The proximity to, and close business ties with, South Africa are clearly a boon to Swaziland’s economy, as the US$3,3034 GDP per capita statistic is 5 times that found in Mozambique. By comparison, neighboring South Africa had a per capita income of US$6,617 in 2013. Swaziland’s main business language is English, which is the country’s second official language after Swati. This helps to facilitate trade with South Africa, in which English is the primary business language despite being the fourth most popular of 8 official languages. This also brings with it the potential to do business with the many other countries around the globe that prefer to conduct business in English. Another major facilitator of trade between the two countries is that they are part of the world’s oldest customs union, which also includes Botswana, Lesotho and Namibia. This means that goods can pass freely between the two nations without additional tax costs, opening up the import/export market and making Swaziland a useful low-cost processing centre for South African goods and raw materials. Without this trade agreement, it would be much costlier for the landlocked Swaziland to procure goods from abroad, as well as to transport its domestic products internationally. 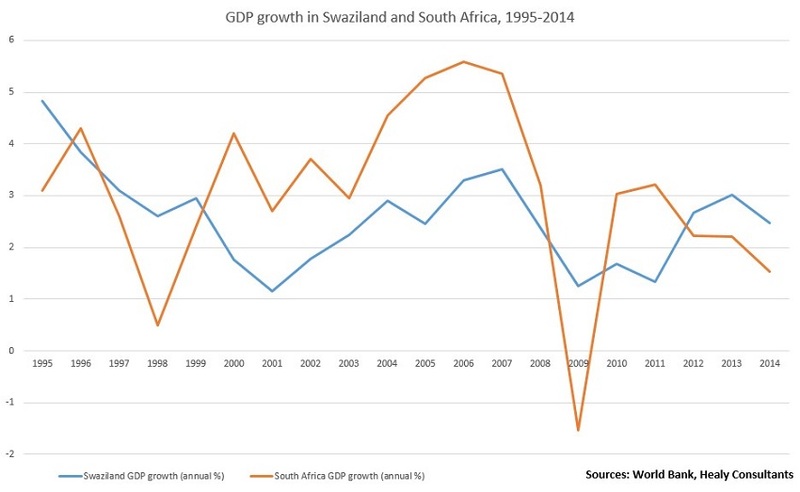 Swaziland’s economic growth tends to follow the direction of South Africa’s economy. Since 1995, GDP growth in these two economies has had a correlation coefficient of 0.34, with that correlation reducing to approximately 0.1 from 1970. The fortunes of these two nations have clearly become more closely intertwined as time has passed. Although this correlation is far from perfect, the differences can likely be attributed to the relative size and international exposure of the South African market, while Swaziland’s economy is more reliant on regional trade. Even so, the absolute direction of the two markets’ growth was the same in 8 out of the 19 years sampled above, or 42% of the time. The Heritage Foundation’s 2015 report on economic freedom estimates that Swaziland received US$67million of FDI inflows, accounting for less than 2% of the country’s 2013 GDP. These low investment levels are explained to some extent by the difficulty of doing business in Swaziland, with the World Bank relegating the Kingdom from 102nd to 105th on its Ease of Doing Business Index for 2016. Swaziland fares even more poorly when it comes to starting a business, falling from 146th to 156th for that category on the same ranking. To learn more about how to invest in Swaziland as a foreigner, visit our website or contact Healy Consultants Group PLC’ experts at . Image credit: Swaziland landscape” by Sara Atkins – originally posted to Flickr as Swaziland. Licensed under CC BY 2.0 via Commons.